Tote all your back to school essentials in the fun and stylish quilted nylon crossbody messenger bag. This spacious top zip closure bag opens to reveal the signature Petals lining fabric. 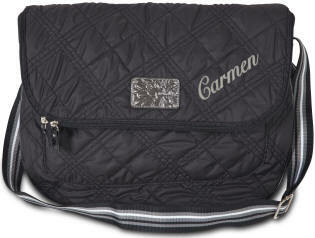 Roomy enough to hold everything you will need with an inside zippered pocket that will keep valuables safe and secure. There's also a pocket for your cell phone. This crossbody messenger bag has an adjustable fabric strap for your comfort. Personalize this messenger bag with the addition of initials or a first name in your choice of thread color and lettering style.